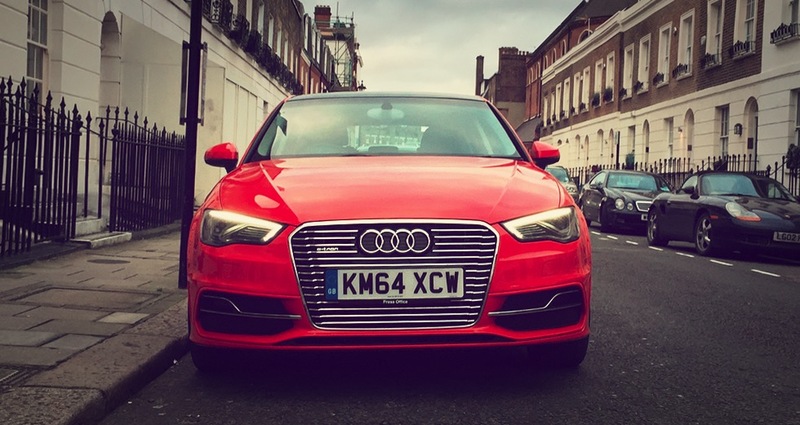 This is no ordinary Audi A3. 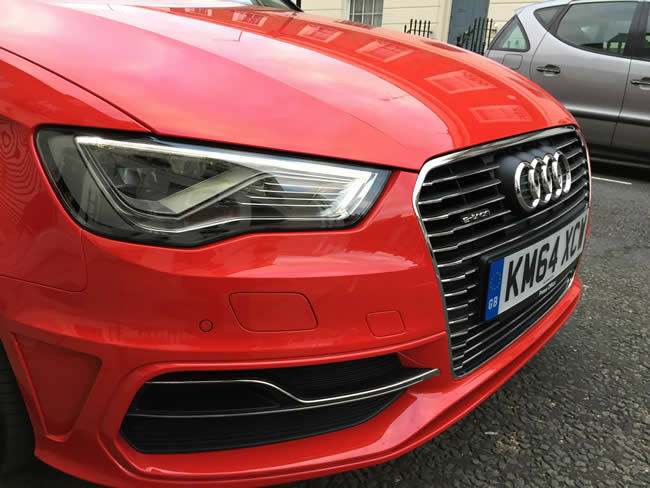 This is the A3 e-tron, Audi’s first plug-in hybrid with a 1.4-litre turbo petrol engine. Introduced in 2014, the first A3 e-tron cars have started to hit the road but you’ll be hard pressed to spot one as they look just like their non-hybrid versions. With a starting price of £29,950 (after government rebate) you get a five-door automatic hatchback packed with plenty of equipment and more buttons than you’ll ever know what to do with. You won’t get the green cachet that you might get from driving some of the other hybrids out there. 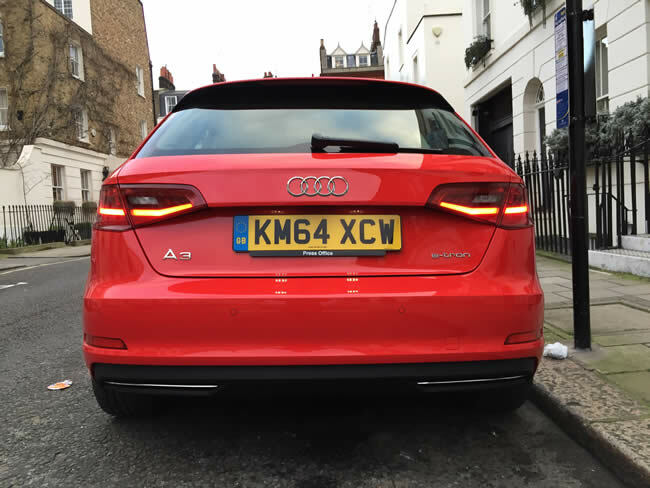 Audi took the sensible option of making the A3 look like an A3 and not like a battery or a leaf or some other suggestive design. The A3 e-tron is largely inspired by the design language from the A1. It’s neither pretty nor elegant from the side or back but its aggressive front isn’t so bad with pretty LED headlamps. Under the hood is a 75kW electric motor powered by a laptop battery tucked underneath the rear seats. Combined with the 1.4-litre turbo-charged 4-cylinder, the total output is 201bhp with a 0-62 time of 7.9 seconds. That’s comparable to non-hybrid performance cars of the same category and 1.5 seconds quicker than the Audi1.4 TFSI model. I’m no fan of the dual-clutch automatic gearbox. Whilst the drive remained smooth and the cabin is well insulated from engine noise, you could clearly hear the gearbox not changing up gear quickly enough. This inevitably resulted in a horrible revving sound that a new learner driver makes when they’re a little overzealous with the acceleration pedal. Having had a taste of the all electric mode, I quickly found myself switching it back to EV mode. 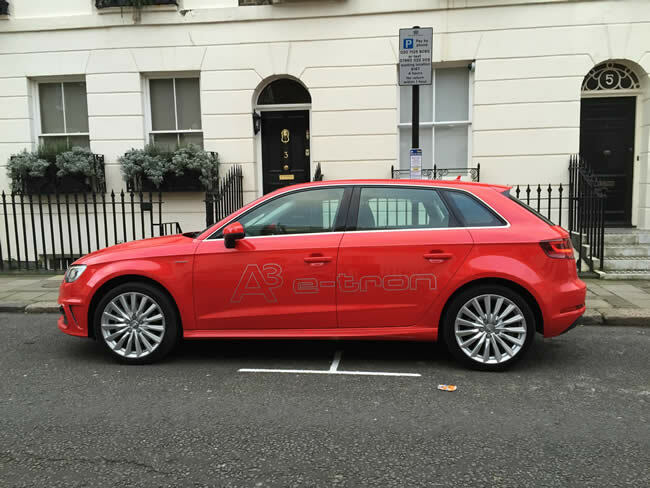 Anyone who owns an A3 e-tron will want to be driving around in EV mode all the time. This is where the electric motor does all the work providing smooth, quiet acceleration with more than enough torque to make the wheels spin. For navigating your way around town and inner city stop-start traffic, it’s a dream to drive. Putting your foot down gives you acceleration unlike anything you will have ever experienced before in a petrol or diesel motor. The power is instantaneous and aggressive but it’s contradicted by the non-dramatic but futuristic whirr of the electric motor propelling you forward. There are of course limitations to using EV mode. With a full charge you can get around 30 miles of sensible driving at up to 80mph before the petrol engine kicks in. For longer journeys you can zap some of the power from the petrol engine to charge up the batteries if you pop the car into ‘Charge’ mode but that means less power to the wheels and increased fuel consumption. Recharge times are 2 to 4 hours depending on whether you’re using a dedicated charging point or using your standard three-pin socket at home. 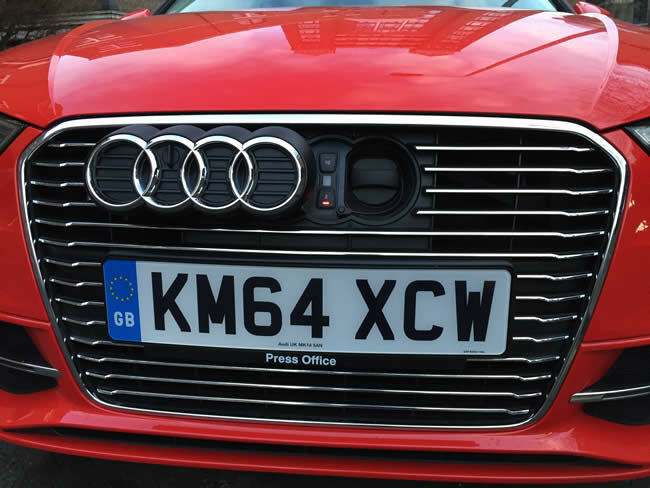 The connector is cleverly hidden behind the Audi badge at the front of the car – simply unlock the hinge and the badge moves to the left exposing the connector. Something had to give in order to make room for the batteries and this does mean less boot space. This is further reduced by the need to carry around no fewer than three charging cables which are neatly stored in a bag – two are for the two different standards of public charging points and a third for plugging in at home. Exemption from the congestion charge in central London, no road tax and free parking in a designated electric parking bay makes for an attractive proposition. However, this is easier said than done. It was to my disappointment that I found my first experience of using charging points around South West London frustratingly difficult. The charging points either didn’t work, weren’t where they’re supposed to be or were tucked away in a private car park. And be warned, if you park in an electric car parking bay whilst not charging – even if the charging point isn’t working – you will get a ticket. 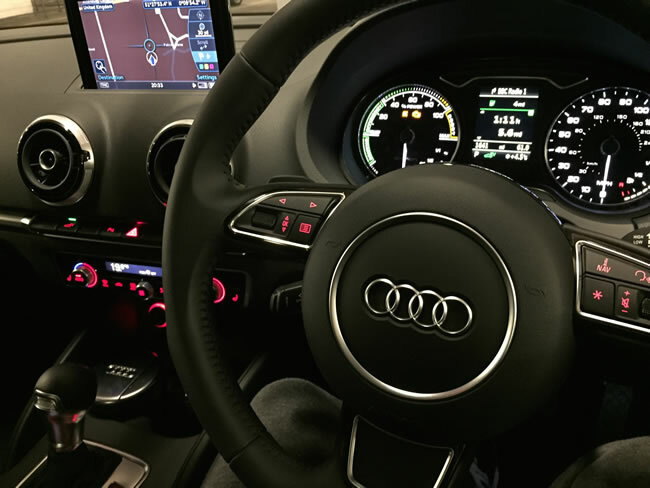 From the large screen that neatly folds away to the buttons and dials, Audi have delivered their signature touch of high-quality and solid refinement for a car interior. The control system in the main is fairly intuitive but there is a lot to get to grips with – perhaps too much. This is a car built for modern times but I fear complexity and granular control has been taken too far. When did we decide that complexity is a selling point when the driver is expected to keep eyes and hands focused on the road? If Audi could improve anything about the interior, it would be to cut the unnecessary clutter from the cabin. The A3 e-tron is perhaps the next big step for electric cars and that’s why it made sense for Audi to put the technology into its most popular selling model. Whilst I don’t see it ever overtaking its petrol and diesel variant anytime soon, I do look forward to seeing the e-tron technology in the rest of the Audi range because it’s about time we had more choice than a Prius. Once the battery is emptied, the e-tron defaults to hybrid mode, where the propulsion is a blending together of both power sources, although even in this mode the electric hardware is still often used solely to power the car at low speeds and at stoplights. 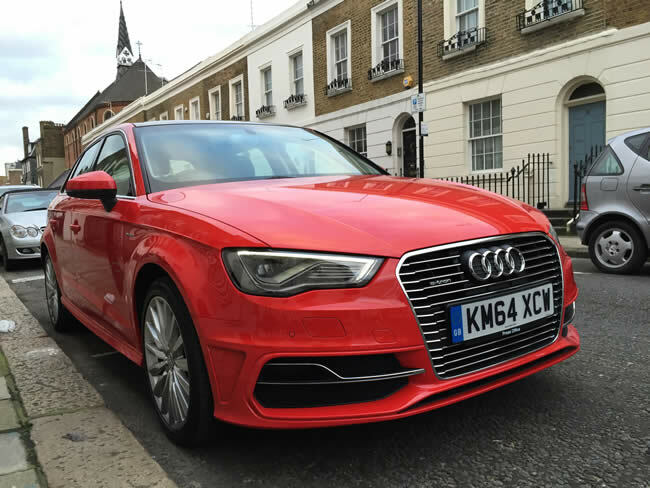 Modes are selected using the Audi MMI infotainment and navigation system, which, despite some menu logic that we found questionable, is fairly user-friendly.